There have been enough news blips mentioning ANC Bio and AFCell Medical to pique the interest of most VT bioscientists. Both companies have attempted to attract foreign investors for Vermont biotechnology projects through the EB-5 immigration program. AFCell Medical has recently decided to pull out of the program due to lack of investor interest, but ANC Bio is over 50% subscribed and expects to be fully funded in the next few months. If they are successful, Vermont will have a new bioscience company in Newport that is expected to employ hundreds of people. The EB-5 program* is essentially a green-card (permanent residency) program for foreign investors and their families. It was created in 1990 to “to stimulate the U.S. economy through job creation and capital investment by foreign investors.” EB-5 investors receive provisional permanent residency for 2 years, with the provision released when their project succeeds in creating 10 or more jobs. If the jobs do not materialize, neither do the green cards. The Vermont EB-5 Regional Center was created by the Vermont Agency of Commerce and Community Development (ACCD) to help both Vermonters and foreign investors benefit from the EB-5 program. The center has a 100% success rate; meaning that, so far, all foreign-investor immigration applications have been approved, and no projects have violated the covenants of their offering memoranda. That stellar reputation is extremely important in attracting people who are considering making a large investment so far from their homes. Brent Raymond runs the center and is very concerned with cultivating and preserving its reputation. “The competition for these foreign investors is extreme and the reputation of the Vermont Center plays a big part in our success” says Raymond. The center accepts only about 1% of projects that begin the approval process—businesses that have a very high probability of success, both in creating jobs and in attracting foreign investors. They also require that project are $10 million minimum size; this is necessary because there are significant fixed costs associated with launching an EB-5 offering, from drafting a business plan and completing an economic study to demonstrating the potential for direct and indirect job creation, to formulating an offering memorandum, developing marketing materials, and finally, traveling to sell investors on the project. Once projects are accepted by the Vermont EB-5 Regional Center, ACCD staff review progress, and continue to check in with project leaders until the terms of the offering memoranda are met. 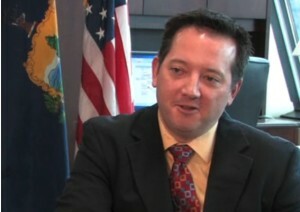 When asked how he thought the EB-5 program might be of interest to Vermont bioscience companies, ACCD secretary Lawrence Miller suggested that EB-5 could present good opportunities for firms with a product that has already received FDA approval and is ready for commercialization—including a distribution agreement. He pointed out that there is a relatively short timeline to meet the job-creation requirements of the program, so projects have to be ready to ramp up quickly. Bioscience companies looking for smaller, more speculative, or longer term investments should continue to seek financing from more traditional sources such as venture capital or angel investors and/or SBIR grants. *The acronym EB-5 stands for “Employment Based Immigration, 5th preference”; behind first through fourth preference programs for people with “extraordinary ability”, advanced degrees, professionals “performing work for which qualified workers are not available in the United States”, and “special immigrants”, such as religious workers, Iraqi/Afghan translators, and broadcasters.